Scott Mussell is seeking this Nirvana flyer from 1989 if you have posters, handbills or any other Nirvana concert flyers contact Mussell at 515.707.7250 anytime or by email at srmussell@me.com. 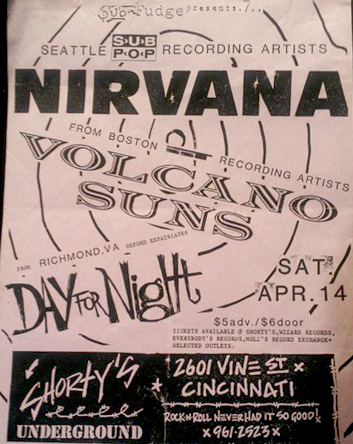 WANTED: CINCINNATI, OHIO NIRVANA CONCERT POSTERS 1989 & 1990. Concert poster collector and Nirvana specialist Scott Mussell is seeking flyers advertising the bands gigs in 1989 and 1990 in the Cincinnati, Ohio area. The now legendary band played a set October 6, 1989 at the little Irish bar Murphy’s Pub. "I don’t know much about the show itself, but I know a handbill and a flyer were produced. I’ve heard it might have been an acoustic set- I’m eager to know more” Mussell said. That summer Nirvana was scheduled to play over the river at Top Hat in Newport, KY July 21, 1989 but cancelled. “I’ve heard there was a flyer advertising this show and I’ve seen a handful of flyers from Top Hat but haven’t been able to confirm a Nirvana exists” Mussell notes. Scott Mussell is seeking this Nirvana flyer from 1990 if you have posters, handbills or any other Nirvana concert flyers contact Mussell at 515.707.7250 anytime or by email at srmussell@me.com. Mussell pays top prices for single owner Nirvana flyers for his archive and accepts flyers in any condition. If you have this poster, the handbill or any other examples of Nirvana concert flyers contact Mussell at 515.707.7250 anytime or by email at srmussell@me.com.